Diva: Dinosaur Impersonating Virtual Analogue synthesizer. 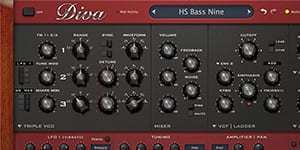 Diva captures the spirit of five decades of analogue synthesizers. Oscillators, filters, and envelopes from some of the greatest monophonic and polyphonic synths of yesteryear were meticulously modelled for unmatched analogue sound. Diva is more than a single synthesizer: Recreate an old favourite or mix-and-match modules to design your own unique hybrid.